Site of the Bank of Lucas, Turner & Co.
William Tecumseh Sherman established the branch bank of Lucas, Turner & Co. in San Francisco in 1853. 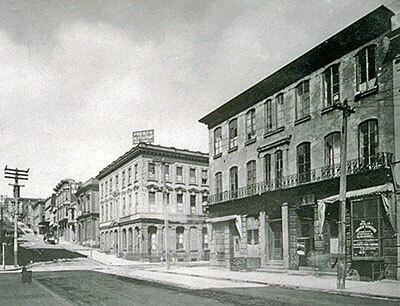 He settled the firm in their own building on the northeast corner of Jackson and Montgomery Streets in the springof 1854. Sherman successfully carried the bank through the financial crisis of 1855, and remained until they discontinued business in 1857. Tablet placed by California Centennials Commission with the cooperation of The Society of California Pioneers. 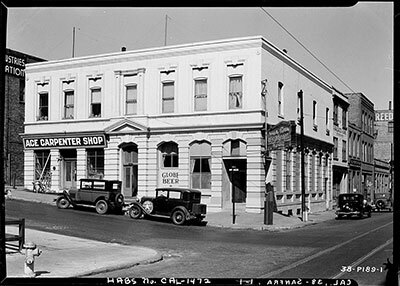 The Bank of Lucas, Turner and Company had been out of business for almost fifty years when this photograph was taken. 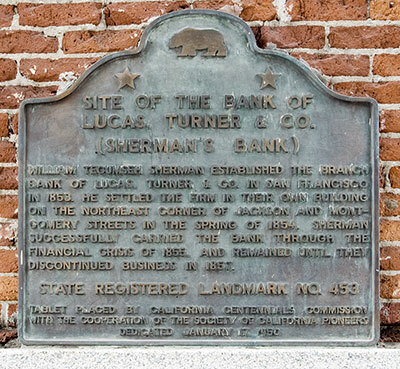 The Bank of Lucas, Turner and Company stands on the northeast corner of Montgomery and Jackson Streets. 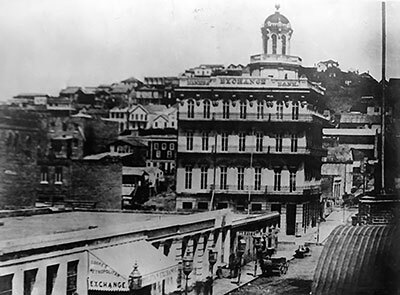 The Miner's Exchange Bank used to stand on the northwest corner. According to the Historic American Buildings Survey, the Miner's Exchange Bank was designed by architect Peter Portois and built in 1854, the last major building before the depression of 1853-1854. It was a four-story brick and stucco building with a granite ground floor. Each floor had cast iron balconies and the building was crowned with an octagonal pavilion and cupola. The cupola was razed in 1868. 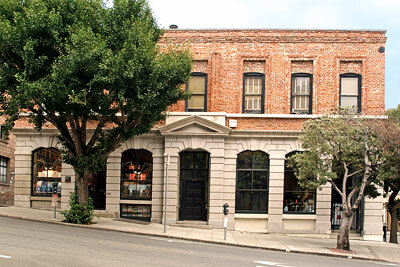 The Bank of Lucas, Turner and Company is in the Jackson Square Historic District and is San Francisco Landmark 26.